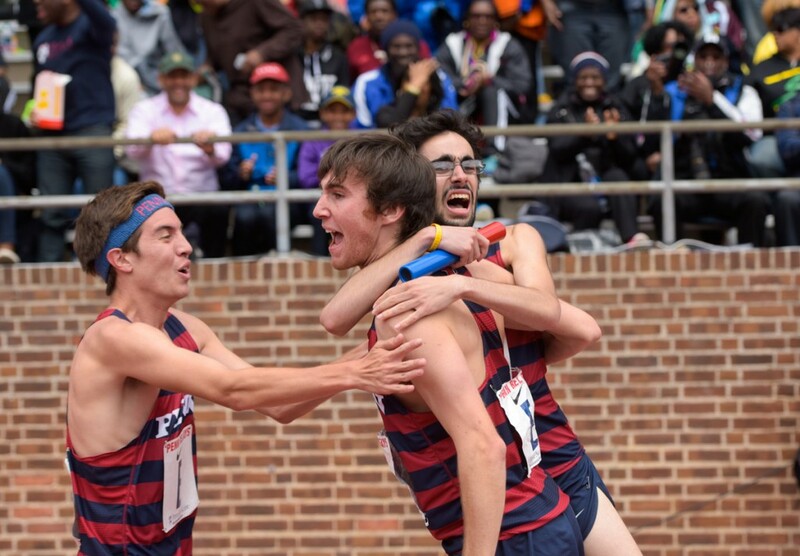 Two years ago, Thomas Awad enjoyed a once-in-a-lifetime Penn Relays moment. Running in an Olympic Development race in the historic track meet at Franklin Field, the senior became the first Penn athlete to run the mile in less than four minutes since 1974 — when D. Elton Cochran-Fikes C’74 WG’79 did it at the same meet. Awad and Cochran Fikes, who works at Penn, then shared a warm embrace immediately after the race — a moment I wrote about it in the magazine and probably seemed like the ultimate Penn Relays pinnacle for Awad. 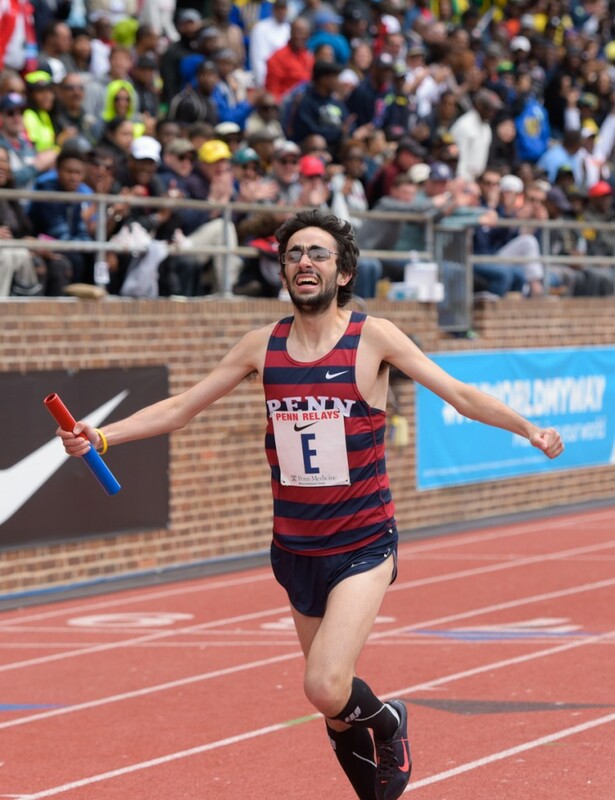 In the final day of his final Penn Relays on Saturday, Awad delivered a dramatic final kick to lead Penn to the Championship of America in the 4xmile — one of the biggest distance races in the country’s biggest track meet — in front of a huge crowd and a national television audience. Penn had not won the 4xmile in the Penn Relays since 1950; Penn had not won any championship relay since 1974; and, at least in recent years, Penn wasn’t even expected to be competitive in the marquee college distance relay events — races usually dominated by national powers like Oregon, Penn State and local rival Villanova. Sometimes, the Quakers didn’t even enter them. 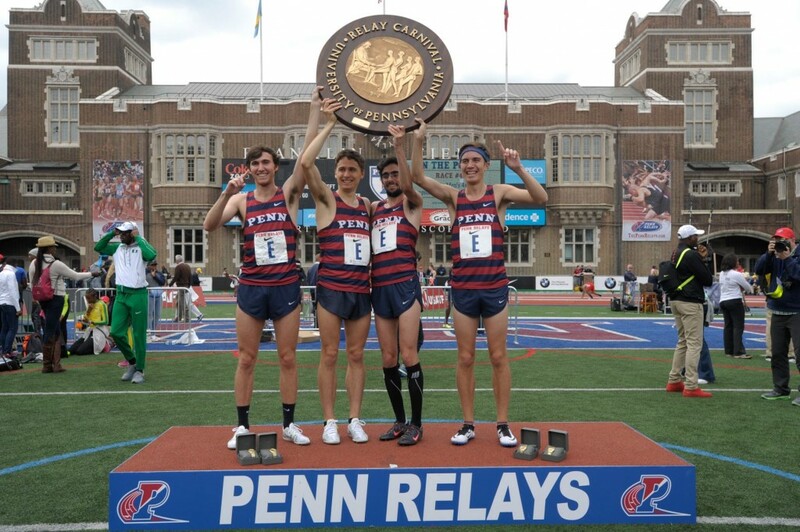 But that began to change last year when Penn track & field director Steve Dolan opted to have Awad run in a couple of relays rather than have him try to defend his individual mile crown. 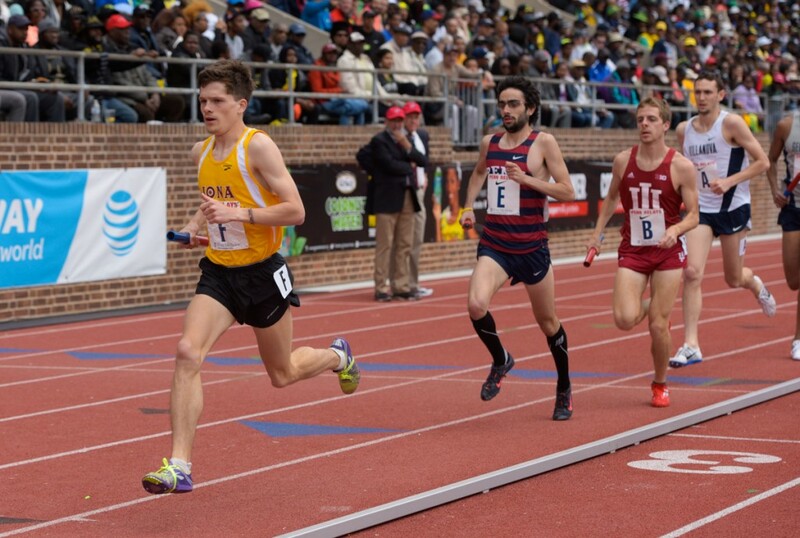 The plan was a sound one but it didn’t necessarily work out great last year as Penn finished in 12th place in the distance medley relay that Awad anchored and sixth in the 4xmile with Awad moving up to the second position to keep the Quakers in the race. Heading into the 2016 Penn Relays, the biggest question was whether Penn has the horses to get Awad the baton in striking distance. And they answered that in resounding fashion, first on Friday when Awad was close to the lead pack for the anchor leg of the DMR but didn’t have enough in his tank to outkick Penn State and Georgetown. Still, the Quakers set a school record with their third-place run — and then got to share it with the previous record-holders from 1972. And it also seemed to give them the confidence to know they could compete in the 4xmile the following day as Keaton Naff, Chris Hatler and Nick Tuck did their job beautifully and had Penn right near the front for the anchor leg. But his coach knew better, shouting in Naff’s ear “He’s gonna do it!” just before Awad’s dramatic kick. “You don’t bet against Awad in the last 100,” Dolan said. Perhaps soon enough, as Penn’s track program continues to rise (Hatler and Tuck are both juniors who are close to cracking the 4-minute mile themselves), you won’t bet against the home team in any of the big college races. For now, though, the Quakers just want to savor a remarkable win when they were still the underdog and still fighting from behind on their own track. “It’s a real honor,” Dolan said. “I couldn’t be more proud of these guys, who worked so hard. We’ve talked about it for years but to be in a Penn uniform and win at this stage of the Penn Relays is as good as it gets.